As an Englishman from the North of the country; I have been raised in the secure knowledge that the pinnacle of human achievement was reached with the invention of the shed. Men need sheds as much as they need air, water and Marmite – It’s as simple as that. A shed gives men independence, freedom, and a place to sit, drink tea and watch the world go round. Having been raised in this belief, I would consider it sacrilege for somebody to suggest that there may be something better and more practical than the shed. It doesn’t seem possible, does it? Well far be it for me to try and improve on the shed, but I do think I have found a possible contender for the next generation of shed. The Ambulance! Before you scoff, think about it! It’s a huge shed, with lots of twiddly things in it, loads of cupboards, built in seats, and and and… AN ENGINE AND WHEELS! You can drive it away and have your shed somewhere else. Think about that! Ok, so now the more naive of you may be asking “Why an Ambulance? Why not just get a camper van?”. Camper vans are gay, that’s why. People who have camper vans are generally utter knobends who should be banned from the road and then shot. 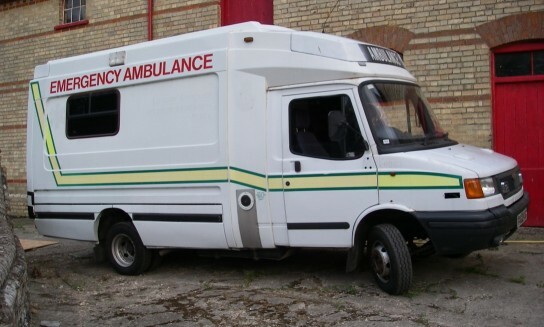 Ambulances on the other hand… Well, you can tell people you got it because it’s a big van, whilst secretly dreading the idea of ever actually having to use up all that space in there. When you get really bored, you can hunt for the sirens, and work out how to reconnect the blue lights. You can try and work out what all the data cabling is for, you can even try and work out why the interior lights only work sometimes. AND THERE ARE BUTTONS! LOTS OF BUTTONS! Trust me on this one any Northern Men out there… Before you go out to the Shed Shop to look for a new hideaway; have a look in Autotrader and see if there are any old ambulances for sale first. You will thank me. Ambulances are all very fine. I however, have a riot van. Run flat tyres, shatterproof everything, armoured lights front and rear, extra battery, ventilation and diesel powered heating, extra bars on the doors, and lockable internal storage. I’ve taken the cage out of the back though.